Around 5:00 A.M. on Tuesday, December 9, 1997, it was time for our baby to arrive. I was in a lot of pain – and wanted more pain medicine! All I could think was that nothing they put in the IV was going to harm my baby, so I wondered why they couldn’t just give me relief. All through these hours in the hospital, I’d been hooked up to a fetal monitor which tracked our baby’s heartbeat. We could hear that thump-thump echoing in the hospital room. When it came time to push, however, the nurse removed the monitor. I didn’t understand why then, but I would later. Within ten minutes, I delivered a precious baby girl with no heartbeat. Sometime during her trip through the birth canal, her bright, brave, eternal soul was taken by her Heavenly Father to be at home with Him. The doctor handed her to the nurse, who cleaned her, wrapped her in a blanket, and put a small knit cap on her head. Weeks before I had told my mom that I didn’t want to hold the baby. I didn’t want to bond, as I felt that would just make this difficult situation even harder. However, my mom gently advised me to reconsider that decision. After I delivered, the doctor got my parents from the waiting room. The nurse brought me our baby and I held her. She was two and a half pounds, and from the neck down, she was perfectly beautiful. Every finger and toe was tiny, but perfectly formed. Even her little face was precious, the only obvious defect her nose, which hadn’t formed the middle separation. The top of her head was encased by the knit cap to cover its deformity. We all held her and kissed her soft little cheek. I was a mama now, my husband a daddy, my parents were grandparents. I hadn’t realized before that it’s more common for anencephalic babies to be girls. Once they took the baby away, we had to decide on a name for her. From out of nowhere, my mind recalled the notes and cards my maternal grandmother had sent during this pregnancy and how she always referred to the baby as our “angel.” I asked my husband what he thought of naming her Angel and we decided it was perfect. I don’t know where “Marie” came from, but that was her middle name. I recovered from the labor fairly quickly. We had decided on a very private graveside service. 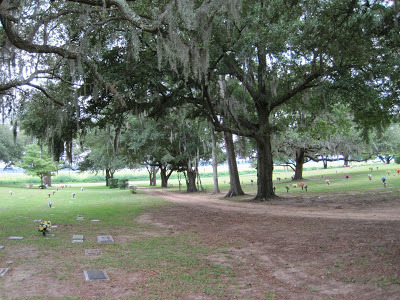 The cemetery we had chosen was beautiful – full of oak trees with a view of the river. (That’s it in the picture at the top of this post.) Our pastor and his wife, the school administrator and his wife (friends of many years), and my parents were there. Sandy, our labor and delivery nurse, had asked if she could come, and I was touched that she took the time to attend. Our pastor spoke a few words and we asked my dad, also a pastor, if he would read two verses from the hymn All the Way My Savior Leads Me by Fanny Crosby. In spite of the trial we had just come through, we were trusting that God had a purpose and a plan. There’s a bit more to the story, and I’ll conclude it next Monday. Beautiful, sad gracious story. So sorry for you lost, even many years later. I love the words of that hymn and the stunning trees in the cemetery! Angel Marie: what a lovely name! And you picked a beautiful location for her. That hymn seems to go perfectly with what you have written about your story. I really appreciate your sharing it. What a sweet name for a babe who was so wanted and loved. What a beautiful name for your precious baby girl. Much love to you for where you've been and for choosing to share the story of your Angel Marie.